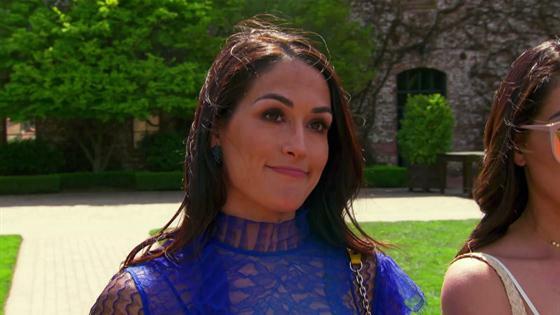 On this week's all-new Total Bellas, Nikki had to make some tough decisions about her big day, including dis-inviting her BFFs as bridesmaids. "I've decided that I'm not going to have bridesmaids anymore," Nikki confessed. "Like, anyone?" Nikki's bestie Shawna asked. "Yeah," the Bella twin confirmed. Despite being sad to miss out on the chance to stand beside Nikki at her wedding, her friends were supportive of her decision. "Here's what you should do: You should do what you really want to do, whatever that means. If that means having bridesmaids have it, if it means not, then don't 'cause this is your day," her friend Katy insisted. Not only will Nikki be walking herself down the aisle, she'll be standing up at the altar without her girl squad, but for the future Mrs. Cena, these decisions are a show of her newfound strength. "The one thing that I do have to say that I felt like I've found since I've been wedding planning, is my voice," Nikki said to her friends before toasting to her upcoming nuptials. 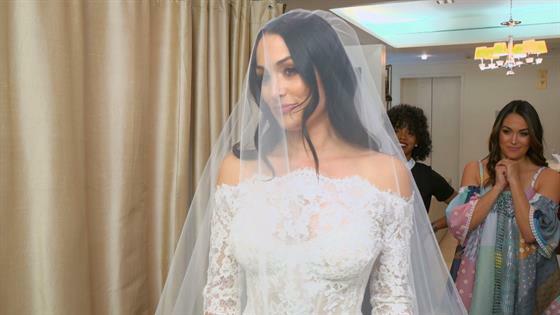 While it may have been tough for Nikki to break the news to her BFFs, the one aspect of wedding planning that has been a little easier for the wrestler has been wedding dress shopping. 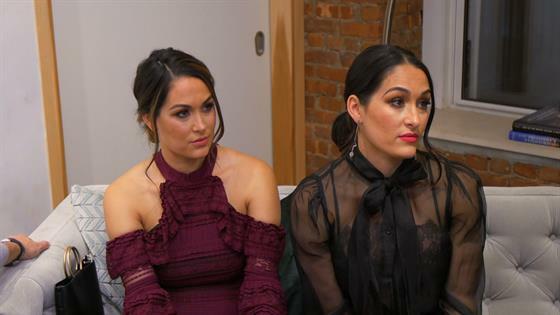 Nikki and Brie Bella searched for that perfect dress on a trip to New York City. "Oh my gosh, I just got goosebumps," Brie shared. "I feel like this is exactly what you've been looking for." "I love this," Nikki gushed. "I feel like a Barbie!" With a bouquet in hand and a veil atop her head, it looked like Nikki had officially said yes to the dress and her sister couldn't be happier. "It's so funny, because you always know when a bride finds her dress because when they walk out and it's like this big smile and they feel like a queen you're just like, 'That's it.' That's the smile I've been looking for lately," the mother of one gushed to the camera. "I just feel like now we've just made a turn. Things are gonna start feeling really special and feel like, 'Hey, I'm getting married.'" Nikki still had more wedding planning to do and planning without her better half was proving to be a tricky task. "It's so tough making these decisions on my own because I just think about like, 'What will John like?' and I don't want him to be disappointed and I want him to love this wedding just as much as I'm going to," Nikki confessed to the camera. "I kinda get nervous making these decisions 'cause it's like, we called the wedding off and since we want to keep our same date, we lost a lot of time." But just because John wasn't there, didn't mean he didn't have his say when it came to things like decor and vows. "Are you guys saying your own vows?" Brie asked her sister. "Actually, I don't think we are," Nikki responded. "He just wants to do the traditional vows that you're supposed to do when you get married." While Brie feels Nikki may have lost her way at times during the process, she knows it's time to take some of that wedding weight off her sister's shoulders. "I don't want my sister to do things she doesn't want to do. She's the bride and the one thing you have to make sure, is that the bride is always happy," Brie insisted. "And right now, she has so much on her plate. She has to do everything, so I need to step up and start helping her out. I gotta be the damn husband right now."